For the four of us, it started with a simple question... Why is it that we can see our friends’ histories on Facebook, and a real-time view of the world’s chatter on Twitter, but we can’t see what the people we care about the most will be up to an hour from now, a day from now or a week from now? Today’s most popular social platforms offer immense social value, but they all have one thing in common - they give users a stream of information that goes backwards in time. Whether it’s a status update on Facebook, a tweet on Twitter or a check-in on Foursquare, by the time we see most of this information being shared, it’s already after-the-fact. When you see that a friend that you’ve wanted to connect with checked-in around the corner three hours ago, what can you do about it? Not a whole lot. But if you see that a friend is going to be around the corner from you tomorrow, it’s a different story. The ‘future-tense’ is actionable. Our lives are full of upcoming plans. Some are formal and others are spontaneous. Some are a few minutes out and others are a few months out. These plans live on our calendars, in email and in the back (or front) of our mind. But no matter where these plans live, we only get a singular view of what’s coming up in our own life. As a result our lives are full of missed opportunities – every day. We weren’t the first people to think about the future tense, so we started by looking at what other options already existed. We looked at platforms like Facebook Events and realized that we don’t use these everyday to share what we’re up to because they’re primarily focused on big events that people are broadcasting to large audiences. We needed a platform that not only let users share bigger events, but also enabled the sharing of everyday events. When it comes to everyday events, some may only be relevant to your family, while it makes sense to share others with a broader audience, like your co-workers or your friends. Enabling more frequent sharing required giving users control over exactly what they’re sharing and who they’re sharing with. We also looked at existing calendars. People who use calendars depend on them. 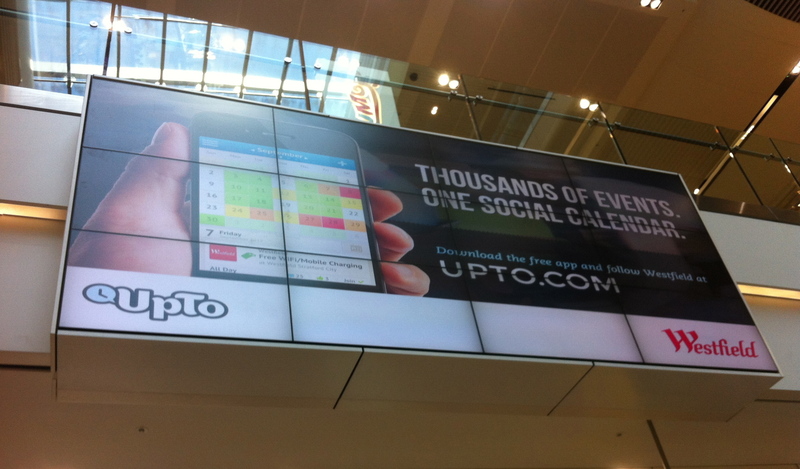 In fact, we found that calendar users check their calendar at least five times a day on average. This is the tool that millions of people worldwide use every day to keep track of their plans. But despite going from paper to the computer to phones, the calendar itself has not evolved – and it’s definitely not social. You can use your calendar to invite someone to an event that they’ll be attending, but you can’t use it to share what you’re up to or to have conversations about upcoming events. With all of this in mind, our first version of UpTo was focused on sharing calendar events with friends, family and co-workers. Users could connect with friends and bucket them into groups, share events straight from their calendar with different groups, add new events, comment on events – even view a heat map showing which days are busier for different groups. We had built a network layer on top of the native calendar and it didn’t take long for missed opportunities to start turning into opportunities. A colleague’s upcoming call with an investor led to an intro to that investor. A friends dinner plans that were shared on UpTo led to a bigger group getting together for drinks afterwards. The examples went on and on, and most of the content getting shared on UpTo was content that otherwise would not have been shared. Like other social applications, the value a user got from our first version of UpTo was dependent on that user having friends that were also using our application. But building a network takes time – it rarely happens overnight. For users with friends on UpTo, we noticed that people were primarily sharing events that were already on their calendar. This was good because the calendar is where a lot of our plans live, but we wanted people to share and discover things that may never have been on their calendar. As we started thinking about our first big update, we knew we needed to create more value for ‘User 1’ and encourage the discovery and sharing of a broader set of events. Our first major update launched last week, and with it we introduced UpTo ‘Event Streams’. With Event Streams, UpTo users can find and follow upcoming event feeds based on their likes and interests with a single tap. 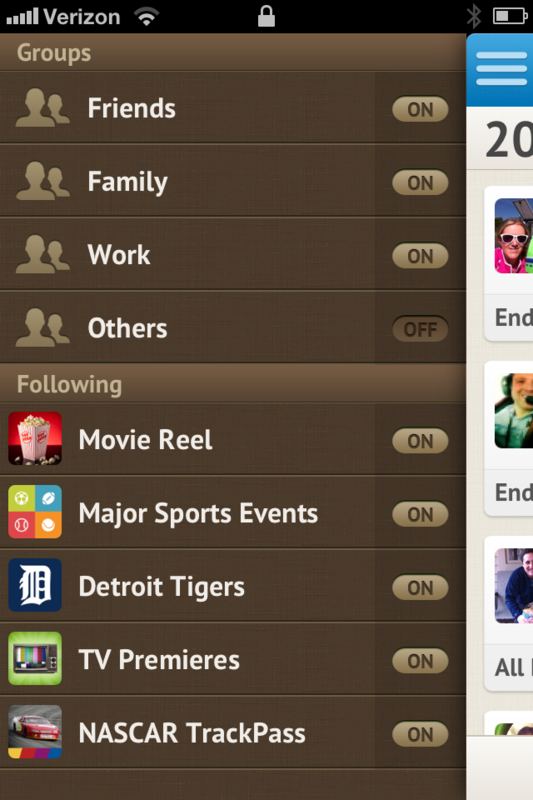 And with another tap, users can add an event from these streams to their calendar and share it on UpTo, simultaneously. Now when a user launches UpTo for the first time, they can immediately follow streams ranging from upcoming sporting and tech events to TV premieres and music releases. We launched Event Streams by partnering with London 2012 Olympic Sponsor - Westfield U.K. UpTo featured a ‘Westfield’ Event Stream highlighting upcoming events happening at Westfield Centres during the Olympics, events happening around London and streams for all Olympic events. But that was just the beginning. With our latest update, we can now add Event Streams for any local business or organization that has upcoming events. If there is an Event Stream that you would like to see in UpTo – whether for a local group or for national events - let us know by e-mailing partners@upto.com. 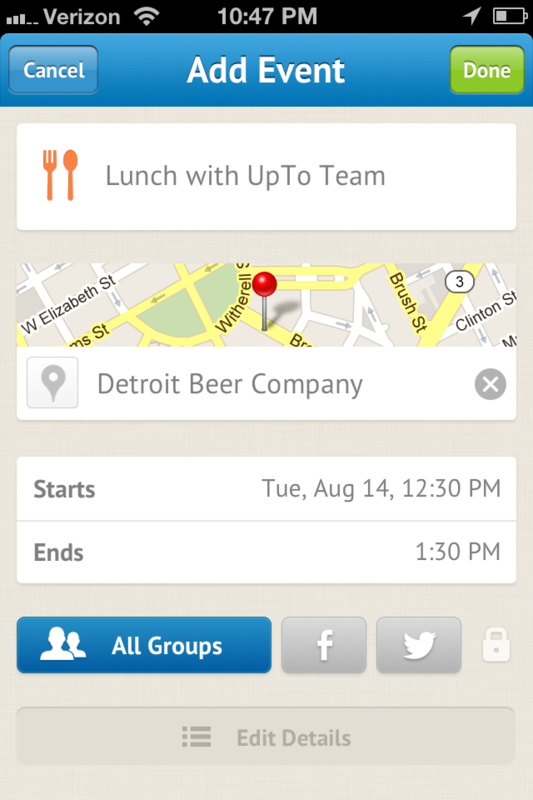 Our latest release also included a user interface update, Facebook Events integration, a new ‘Add Event’ screen with Foursquare venue look-up for addresses, and the ability to ‘Join’ events. 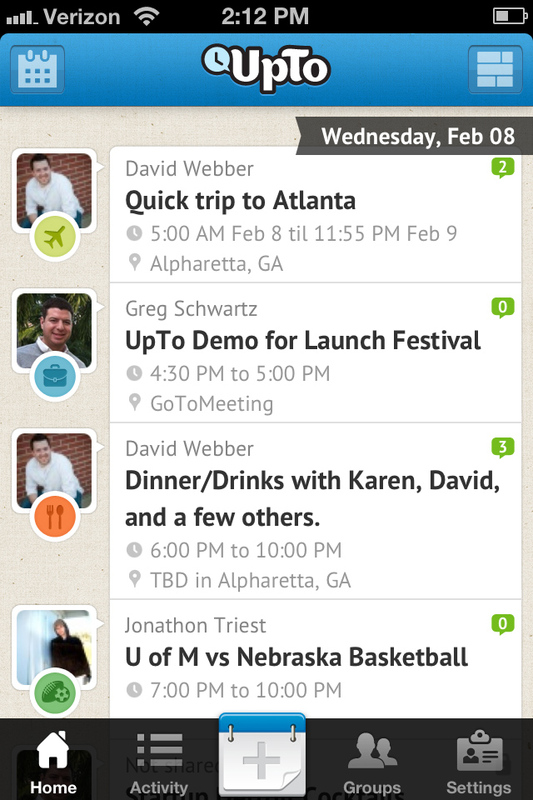 In addition to more iPhone app updates on our roadmap, we also have an Android version of UpTo coming very soon. We believe that the future-tense presents a massive opportunity and that there are immense benefits to being able to see what’s coming. While other social applications inform users about what recently happened or what’s happening now, UpTo lets you glance into the future. We’re confident that UpTo will open the door for you to new opportunities, better communication and even occasional, planned serendipity. When you check out the future, we think you’ll like what you find. So download the app (it’s free), follow some Event Streams, share what you’re UpTo with friends and let us know what you think. Good or bad, day or night, we want to hear from you – even if it’s just to say hello. You can email us at founders@upto.com.